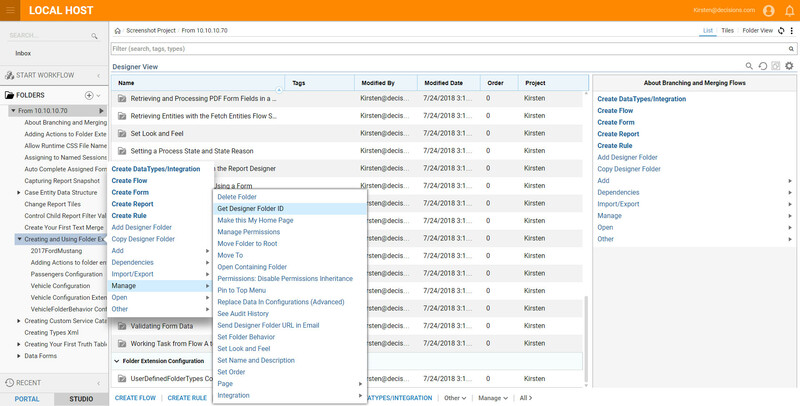 This topic helps identify the relationship between the IDs for folders and their containing entities. A FolderID	is an identification document that is used to uniquely identify a folder. 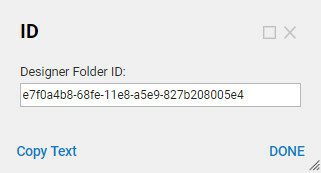 Every folder in the Portal has a folder ID, and one way of seeing the ID is to right click on the folder and select Manage > Get Folder ID	from the folder itself. If the folder is of type Folder Extension (i.e., a custom-defined folder type) instead of Get Folder ID	, the Manage	menu on the folder will show Get [folder extension name] ID	. Even if a folder is of a custom type, it is still a folder having "normal" folder properties. The FolderID property is especially important for folder extension type of folders because it is needed to link a folder to actions created for that folder type, and for linking entities that will go inside that folder. 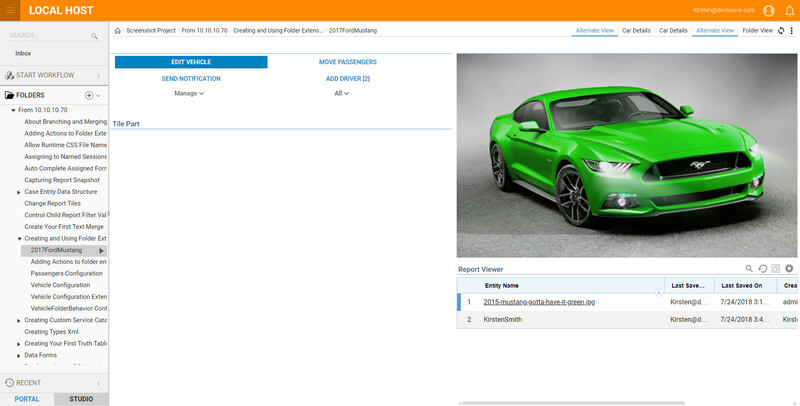 The car information for Ford Mustang is handed in to the Edit Vehicle	flow so the flow knows which vehicle to edit, all off of the FolderID property. 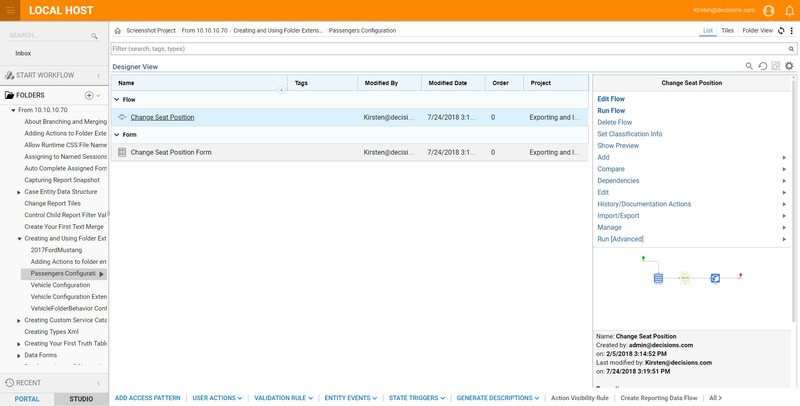 For example, this flow uses the Update Entity	step to set up Portal settings. 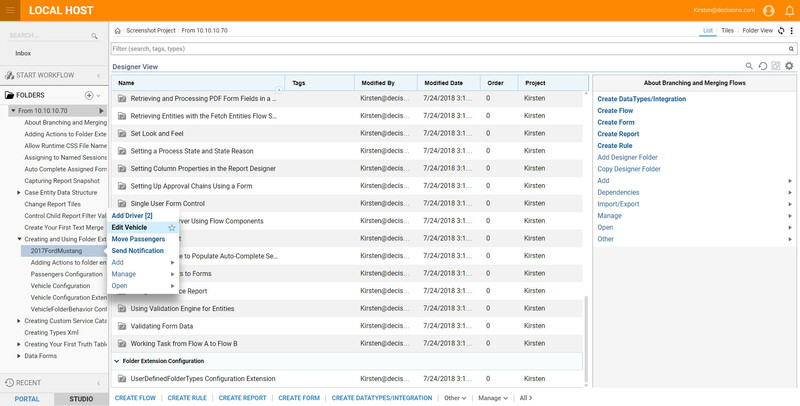 This Flow is an example of how to use a step to set the portal branding preferences. 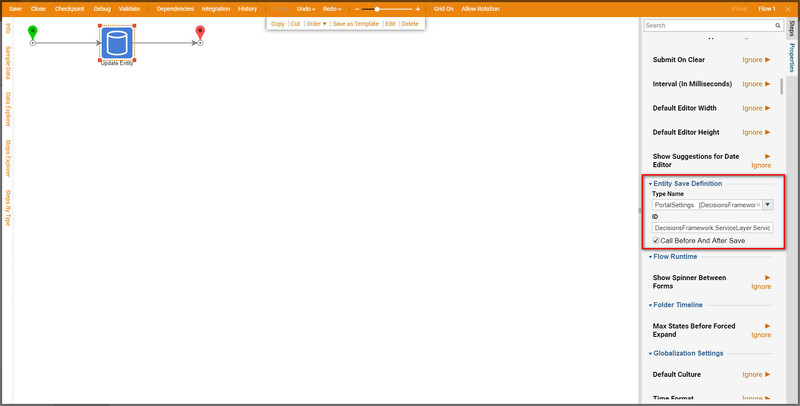 Changing this flow gives the user a quick way to consistently apply a logo, theme, portal names, etc. In cases where the entity is a folder, the FolderID property and the EntityID property will be the same. 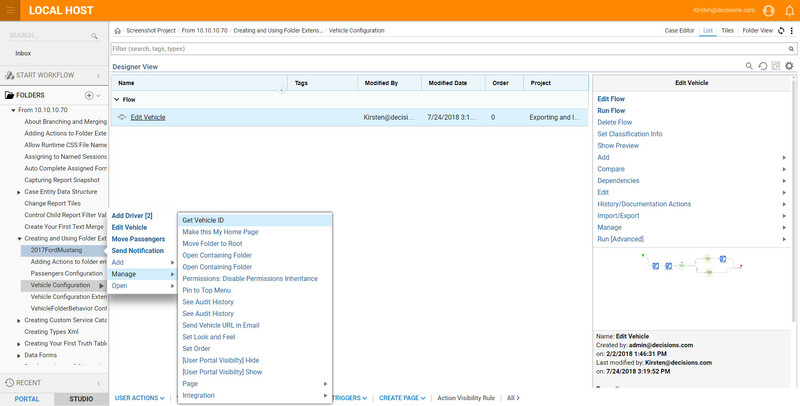 The EntityID property is especially important for folder entities because it is needed to link an entity to actions created for that entity type. 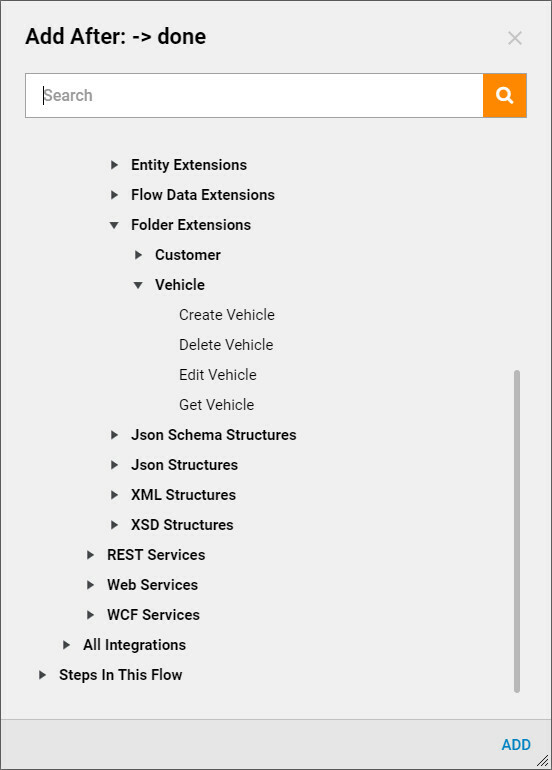 For example, the screenshot below shows an Entity Actions and Configuration folder that is for a Designer Folder folder extension. The Designer Folder is an entity that has properties like vehicle. Those are details that define the entity. The way that the action flows in this Entity Actions and Configuration folder (for example, Change Seat Position ), know about the specific entity is by EntityID. Parent folder	to 2017 Ford Mustang. This is just a standard root folder. 2017 Ford Mustang	- Folder extension of type "Vehicle" that contains car passengers. Folder extensions are folders that have the properties of a "normal" folder but also have custom properties; in this example, "make," "model," "year," and "color." 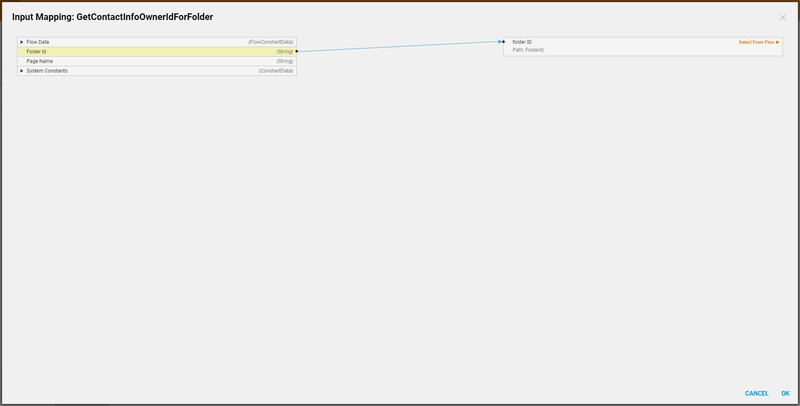 When a new Vehicle is created in a flow, its output is its Folder ID. Car Passenger	- Folder entity. 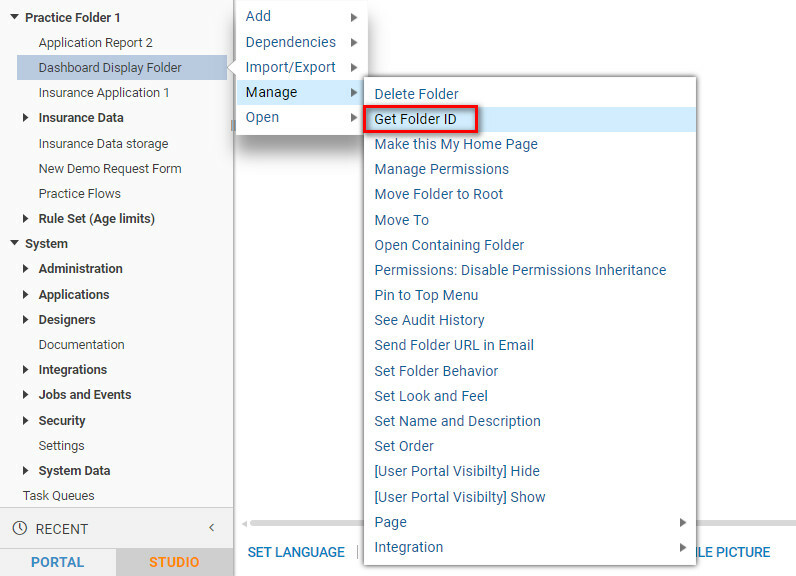 folder entities know where they "live" in the portal by their entity folder ID property. 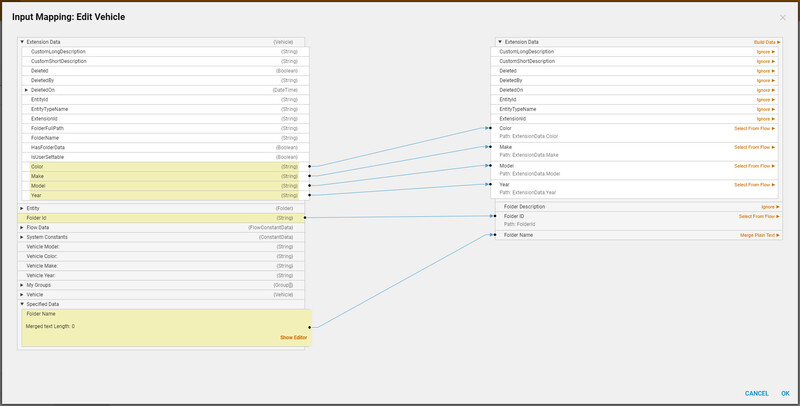 The structure of the entities is actually stored in the database. Folder entities have an entity ID to uniquely identify the entity itself, and they have an entity folder ID, which identifies the folder in which the entity is found. When a new Vehicle Passenger is created in a flow, its output is its Entity ID.